Abstract: Etalons are often used as spectral filters and are tuned by tilting. The article discusses how tilting affects the transmission wavelengths and the transmission loss via a reduction in beam overlap. Let us consider a solid etalon, consisting of a transparent plate of a material like fused silica, for example, with flat and well polished surfaces. These surface can have reflecting dielectric coatings for increasing the finesse. Maximum transmission (near unity) is only possible for wavelengths where the etalon is resonant, i.e., the round-trip phase shift is an integer multiple of 2π. Such resonances occur at approximately equally spaced frequencies with a spacing which is called the free spectral range. The transmission bandwidth is the free spectral range divided by the finesse, with the latter being determined by the surface reflectivities (at least in the simplest cases). In Which Direction Do the Transmission Peaks Move? It is a common method to tune such an etalon to a certain transmission wavelength by tilting it. A first interesting question is whether an increasing tilt angle increases or decreases the wavelengths of the transmission peaks. A seemingly plausible but wrong argument is that tilting makes the beam path longer, and that this must be compensated by a longer wavelength. In reality, however, the round-trip phase change is decreased rather than increased! A somewhat formal (but correct) argument for this is that the projection of the k vector to the direction perpendicular to the surfaces is reduced. But what is wrong about the previous argument? This is explained in the Spotlight article of 2006-11-02. The correct conclusion is then that the transmission peaks move to shorter wavelengths when the tilt angle is increased. See Figure 2 for a calculated example case. 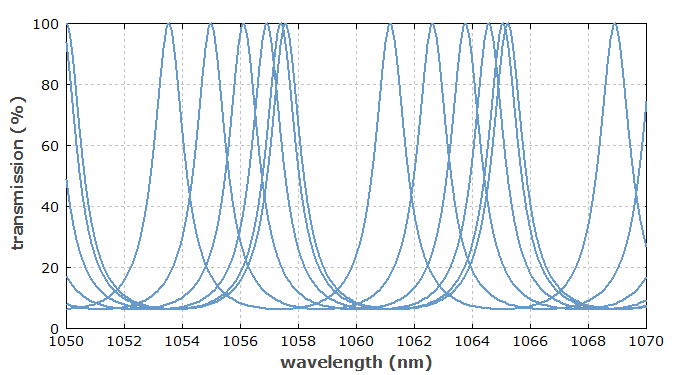 Figure 2: Transmission curves of a 50 μm thick fused silica etalon with 60% surface reflectivity. The curves correspond to tilt angles from 0 to 5° in steps of 1°. Increasing angles shift the transmission to shorter wavelengths, with an increasing rate. Another issue is that tilting causes a transverse offset of the circulating beam after each round trip. Obviously, this can affect the interference conditions and thus the etalon's performance. In an extreme case, where the etalon is quite thick, the tilt angle is large and the beam radius is small, there is no overlap at all, so we have no interference, and the etalon will not function as a wavelength filter. On the other hand, the transverse offset may be negligible when the etalon is thin, the angle is small, and the incident beam is large. But where does tilting begin to cause a problem? The answer to that question is often essential when applying etalons, e.g., for wavelength tuning of lasers. A customer of mine recently directed my attention to claims of an etalon manufacturer, where they use a simple rule for calculating the resulting loss. They take the finesse as the effective number of round trips and calculate the total transverse beam offset within these round trips. Then they divide this total offset by the beam radius, and claim that the result is the fraction of the power which is lost due to the tilt effect: the maximum transmission is reduced by that amount. Well, I didn't believe that this is true, and thus made my own calculation. The right way of doing this: take the electric field distribution of the incident beam and calculate the field distributions after multiple round trips, where the total power is reduced depending on the surface reflectivities, and the transverse offset increases with each round trip, depending on the thickness and the tilt angle. By adding up all reflected field components, one obtains the total electric field reflected by the device, for example for a wavelength where the device is resonant. Without any tilt, the first reflection is exactly canceled by the sum of all other reflected components, resulting in zero reflection and thus total transmission. (I assume the ideal case where both surfaces have the same reflectivity, the mirror coatings have no absorption and scattering losses, the surface quality and parallelism is perfect, etc.) With some finite tilt, this is no longer true due to the transverse beam offset. Figure 3: Reduction of the maximum transmission of a 50 μm thick fused silica etalon with 60% surface reflectivity. The incident Gaussian beam has a beam radius of 200 μm. Figure 3 shows results for an example case. For small tilt angles (few degrees), the transmission losses are much smaller than those calculated with the crude technique explained above. For example, we obtain ≈ 0.33% loss for a tilt of 5°, whereas the crude method predicts nearly 18%! 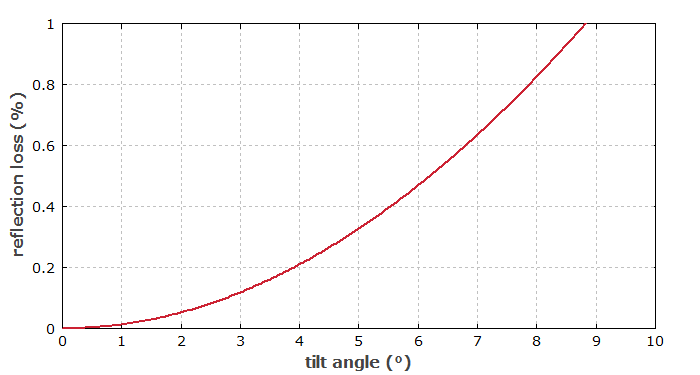 For increasing tilt angles, however, the losses increase more than in proportion to the tilt angle, so that eventually they can get significant. It may be surprising that the crude estimate is so far off. However, consider the example case with numbers as used for Figure 3 and a tilt angle of 5°. The finesse is ≈6, and within 6 round trips there is a total transverse offset of 36 μm, which is 18% of the 200-μm beam radius. However, within 6 round trips the optical field amplitude is reduced to only 4.7% of the initial amplitude. Therefore, it doesn't matter so much if there is some transverse offset by then.